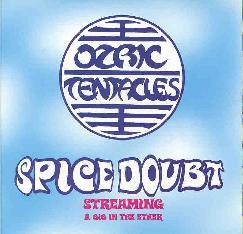 Ozric Tentacles - "Spice Doubt Streaming: A Gig In The Ether"
Spice Doubt is the CD version of a live internet "netcast" concert that took place on June 7, 1998. An interesting little bundle, it comes encased in a green gel-filled packet that is somewhat airtight and can't be easily pulled off. The trick, as I found out too late, is to insert two envelopes on either side of the jewel box which releases the suction and lets you remove it. (What I mean by "too late" is that I got impatient and took to it with a scissors.) According to the Ozric Tentacles website this is supposed to be a limited edition of 7500 copies that will not be commercially available. Which is interesting because I got mine at the local Borders and have had several other reports of its easy availability. But hey... that's a good thing. For a long time only "Arborescence" and "Jurassic Shift" were readily available in U.S. music shops so along with the Snapper re-releases the Ozrics catalog is getting easier to find on this side of the pond. The good thing about Spice Doubt is that the music is nothing short of amazing. It rocks hard and does so in a far off galaxy. The classic Ozrics low end pounding rhythms are accompanied by fiery synths and a guitar sound that blazes into orbit. Explosive tracks like "Sploosh", "Oolite Grove & Citadel Jam", and "Dissolution" feature rapid fire guitar licks and phenomenal synth work. The Ozrics gift is that they are totally cosmic but their music is nothing to relax with. This is warp ten and climbing. The problem with Spice Doubt is that we've all been here too many times before. The band has mastered their style and seem to be prisoners to it. Take a chance guys... experiment a little! I was going to finish off this piece by saying "for completists only", but the fact is this is a nice live testament with great sound and the band smokes. Do what I did. I wasn't going to mail order it but when it was staring out at me from the CD racks I grabbed it.